Jain temples of Marathwada region are very less renowned to common Jain laymen but in fact these temples are attestation of antiquity of Jainism and prevalence of non violent creed in Marathwada region under patronization of several imperial dynasties like Rashtrkoota, Later Chalukya and Yadavas. Marathawada region consists of Beed, Latur, Osmanabaad,Parbhani,Nanded, and Jhalana districts. Today we are illustrating a Jain pilgrimage center which is not only ancient but facing lack of attention, care and donation from Jain community. There is only a single Jain family which has been performing priest as well as laymen duty. Shelgaon Mahavishnu :- Shelgaon Mahavishnu town is situated in Gangakher tehsil of Parbhani district of Maharashtra state. This place is situated about 90 Kilometers apart from Beed district headquarter in east direction where 45 Kilometers apart from Parbhani district headquarter in south west direction. Chintamni Parshwanath Jain temple:- The Chintamani Parshwanath Jain temple is situated in narrow passages of Shelgaon Mahavishnu town. The Jain temple is neither a grand structure nor an artistic monument. It has a house type structure and priest family is living at nearby place. The temple has a small entrance which resembles as an ordinary house entrance. On the right hand side of shrine entrance; an ancient Jain pillar is standing of about 2 to 2.5 feet height which have carving of Jina in kayotsarga posture. Although the Jina figure depicted on the pillar is literally obliterated. The pillar seems a part of ancient Maanstambh whose other part is preserved in the same temple. As we enter the temple we find a mesmeric, serene and benign faced Kayotsarga Jain Teerthankar sculpture of 23rd Lord Parshwanatha. The image of Lord Parshwantha is considerably ancient perhaps from 12th century AD, sculpted in black basalt stone which has about 3 to 3.5 feet height. Lord Parshwantha is principal deity and paramount of this temple which is reckoned as Chintamani Parshwanatha. On the name of the paramount lord; the shrine got its name as Shri Chintamani Parshwanatha Atishay kshetra. The image of Parshwanatha is installed on main vedi along with some bronze Jina sculptures of Jinas. There are one niche on both sides of main vedi which contain Jina teerthankar sculpture, Panchmerus and a panel of ancient sculpture’s toran. A yakshini sculpture perhaps of goddess Padamawati is also installed besides the entrance in the shrine. The temple has also a basement which is also accessible from the main temple. Perhaps basement is an ancient structure and constructed for protection of Jina sculptures from invaders in medieval period of History. The basement consists of a vedi which has three Jina sculptures in Padmasana meditation posture. A new vedi is constructed on the second floor of the temple which contains three Padmasana Jina sculptures of Mahaveera, Parshwanatha and Neminatha. History of Shelgaon Mahavishnu :- The town got its name after the temple of Lord Vishnu which is famous here as Mahavishnu commemorate the Mohini – Bhasmasur episode. The Jain sculpture of Parshwanatha, Yakshinis and relics of Maanstambh prove antiquity of this place. 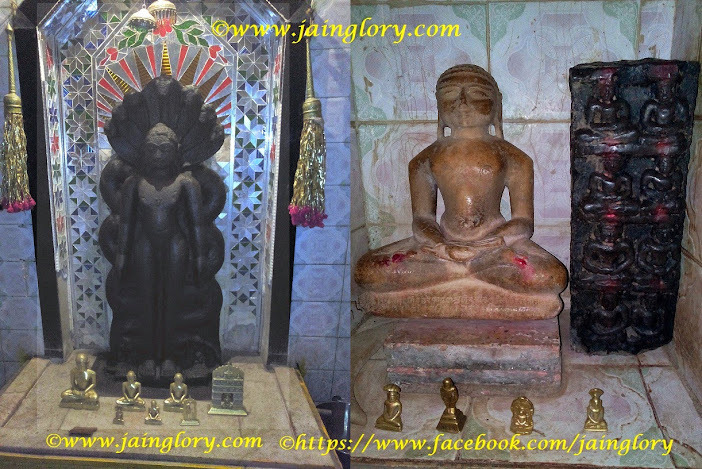 It seems that these ancient Jain relics along with Jina Parshwa image should be hailed from 12th century AD from Yadavas or Later Chalukya era. The hindu temple of Mahavishnu is also hailed from this time span.